Transcell Technology BSS is a popular tool steel S-Beam loadcell that is ideally suited for scale conversions and general-purpose weighing. Compact and rugged design. Complete with 20'/6.1 m of load cell cable. 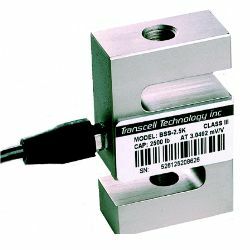 Transcell Technology BSS S-Beam Load Cell is a popular tool steel S-Beam loadcell that is ideally suited for scale conversions and general-purpose weighing. Compact and rugged design. Complete with 20'/6.1 m of load cell cable. Similar to Rice Lake RL20001 and Sensortronics 60001.